Oxygen masks are a common piece of equipment carried by firefighters, emergency medical technicians and the crew of airplanes. Unfortunately, in cases where a family dog is involved in an emergency, these life-saving masks won't be of use unless they are specially made for dogs. During an emergency disaster like a fire, dogs will often try to hide out of fear, which makes him or her very vulnerable to smoke. The dog inhales it and too much can lead to death in many cases. Dogs and many other family pets cannot take regular oxygen because our human masks are built too large to fit their faces. According to the AVMA, about 40,000 pets die each year from fires and this is primarily because of smoke inhalation. Once a firefighter rescues an animal from a burning building, the animal often needs a lot of oxygen at once. While human oxygen masks do not fit dogs, there are resuscitation masks made especially for animals. These masks usually come with several size attachments so that any type or size of dog can benefit from it. A good example of how important oxygen can be to a dog that is suffocating, whether from smoke inhalation or for other reasons, is the documented use of a mask on an airplane. While the masks used are not the type made specifically for dogs, in this instance the oxygen provided by the mask made for humans was able to provide life-saving oxygen to a French Bulldog in desperate need. The masks fit snugly around the mouth and nose and provides oxygen as the dog breathes normally. Unlike an oxygen mask for a person, the mask presses on a dog's jowls to keep them shut so that the dog takes oxygen in through his nose. It has the additional benefit of protecting the rescuer from being bitten as the frightened animal starts to revive. The masks can be used again and again after cleaning. Who Has Oxygen Masks for Dogs? 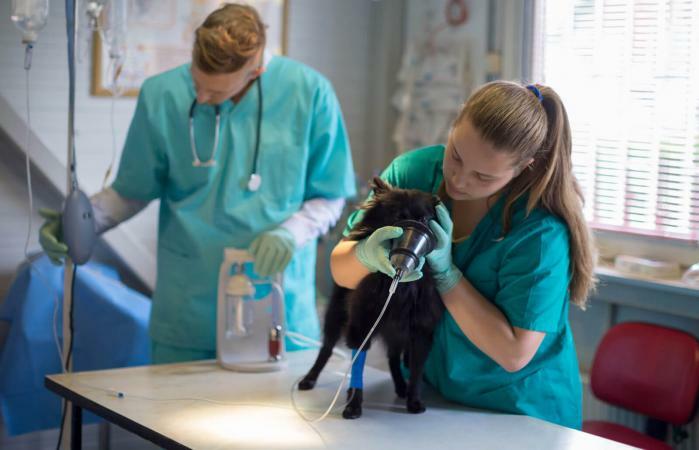 You can find an oxygen mask in just about every vet's office because they are used to put animals under anesthesia for surgery. Unfortunately, many first responders do not have pet masks due to funding. The Emma Zen Foundation, a charity which funds pet oxygen masks for first responders, notes on their website that most departments get masks through donations because they are not part of the national standard. This national standard is a set of guidelines for equipment any fire station should have and presently it does not include oxygen masks for pets. As a result it's difficult for stations to receive public funds for non-standard equipment. Currently only about 23% of fire departments in the U.S. and about 1% of EMTs have oxygen masks for dogs. You can purchase an oxygen mask for your dog from several sources online, either for yourself as part of a canine first aid kit or as a donation to your local fire department. Bound Tree Medical is an equipment supplier for EMTs that carries SurgiVet Recovery Oxygen Masks for dogs and cats. The mask is about $42 and comes in three sizes: small canine, large canine and large feline. You can also purchase a kit with all three masks for about $202. Note that this is for the mask only and the oxygen tank is a separate purchase. The same mask is also available from EMT supplier Life-Assist for $46 per individual mask or $125 for the set of 3. Purchasing a mask and viewing the pricing on both websites requires setting up a free online account. Amazon.com carries the McCulloch oxygen mask which comes in small, medium and large for $40 each, or as a set for $90. You will need to buy the oxygen tank separately for the mask as well. The small size is meant for cats and for small dogs with short snouts such as Pugs. Should You Buy an Oxygen Mask for Your Dog? The Emma Zen Foundation recommends learning pet first aid and CPR instead. This is because they believe this type of equipment is best used by emergency personnel and can do more good for pets this way. If your dog is experiencing a breathing problem, this should be handled by your veterinarian. There may be many other factors involved in the condition that needs a medical expert's supervision. Home oxygen can be potentially deadly in untrained hands and misuse can lead to fires and other serious and even fatal accidents. You can find local pet first aid and CPR classes through the American Red Cross and PetTech. An oxygen mask can definitely be a critical tool in saving the life of a dog suffering from smoke inhalation, toxic chemicals in the air, or suffocation. Consider buying one for your local fire department or EMTs as a way to help out not only your own dog but other dogs in cats in need in your community. If you're not sure how to donate a mask, the Emma Zen Foundation, Project Paws Alive, Project Breathe and Wag'N O2 Fur Life Programs all have a mission of providing these valuable rescue tools to first responders across the United States.